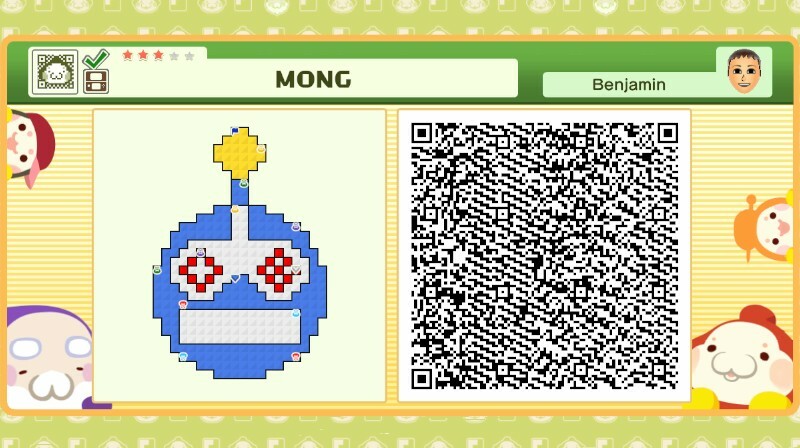 DOES IT PUSHMO THE ENVELOPE? Back in 2011, 3DS owners were treated to a fantastic little puzzle title called Pushmo. Last month, the Wii U received its own version called Pushmo World. So how does the new edition stack up? Pushmo World is a puzzle game where you control a sumo wrestler named Mallo. The objective is to push and pull colored blocks in and out to make your way to the goal. Despite his rotund build, Mallo can hop up the various platforms with ease. Don’t worry if it doesn’t make sense right away. Pushmo World has a number of useful tutorials and practice levels so that even the most inexperienced players can learn the basics of Pushmo. Once you’ve played a few levels, it will sink in. At first glance, it seems pretty simple, and the first puzzles are certainly easy. It doesn’t stay that way, though. Throughout the game, puzzle difficulty will range from “so-easy-a-baby-could-do-it” to “black-belt-karate-kick-to-the-skull”. It may be difficult not to throw the GamePad in a fit of rage. There are more tools than just pushing and pulling, too. The Rewind feature lets you rewind time to a certain point. This is very useful if you make a wrong move or accidentally fall from a ledge. If that doesn’t help, then you can stomp the Reset arrow to reset the puzzle to its initial state. To add more variety to the puzzles, some levels will have manholes or switches. Manholes comes in pairs. Go in one, come out the other. The blocks where the manholes sit must be pulled out to be used, so take note of where the manholes are so they don’t get covered up or hidden. Switches can either pull blocks of a certain color all the way, or push them back in. They can be useful, but they can also prevent you from finishing a level if you’re not careful. But despite the downright devilish designs of some levels, the game rarely feels like a chore. There are hundreds of puzzles, but they are small enough that players won’t lose interest too quickly. 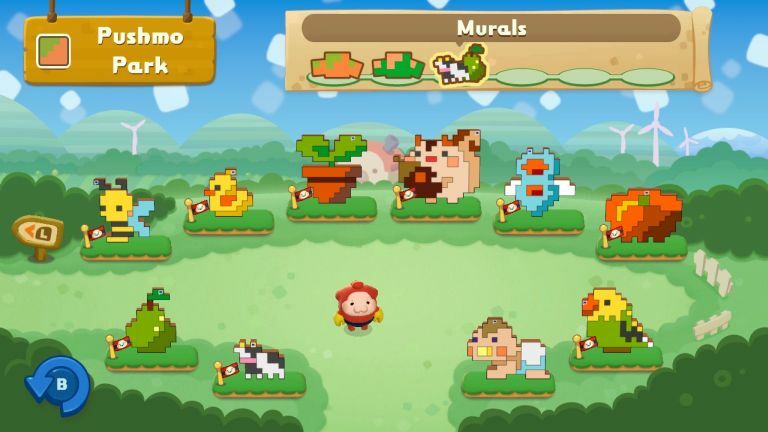 Plus, many of the puzzles are pixel-esque murals featuring animals, objects, and even famous Nintendo characters. And there’s always the option to skip to the next level if it’s too difficult. In addition to standard Pushmo, there are Mystery Pushmo. These puzzles are largely the same, except that each set has a different gimmick, such as timed blocks that pull themselves in after a certain amount of time. I know what you’re thinking. “When I finish all the puzzles, there’s nothing left for me to do.” FALSE. 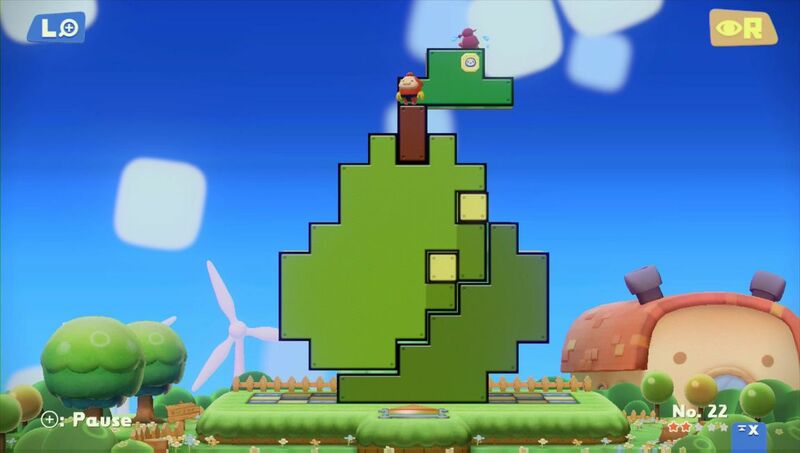 Pushmo World includes a level editor that allows players to create any kind of level imaginable, using any of the items available in standard Pushmo levels. Not only that, players can create a QR Code to share levels with friends, or upload it to the Pushmo World Miiverse Community for the entire planet to enjoy. Just scan the QR Code to get the level. Even better, QR Codes are cross-compatible between 3DS and Wii U, so you can share and scan levels from either version of the game. 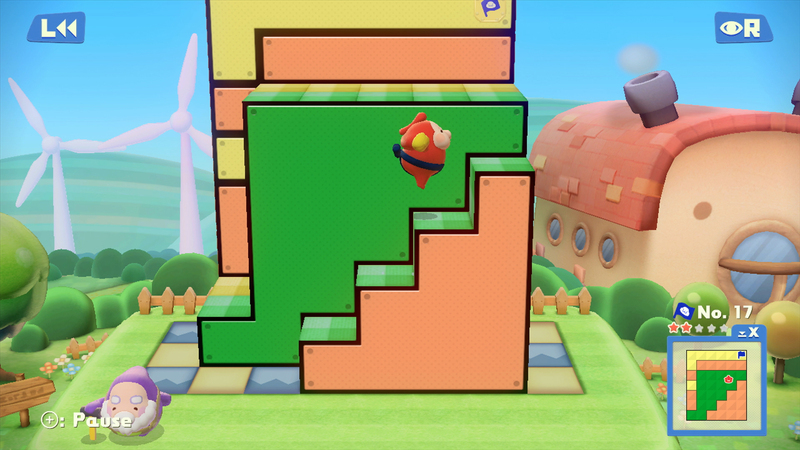 This gives players a virtually infinite number of Pushmo puzzles to play. Scan the code below to get the MONG level. Just try not to feel bad that you will never make a puzzle so awesome. There is one minor issue with Pushmo World, which is the camera. Pushmo feels like it was designed for the 3DS, because the 3D graphics let you see how far a block is pulled out without having to rotate the level. The Wii U version lacks this feature, so it does make it a little more difficult to tell how far certain blocks are pulled out. To be clear, the game is completely playable without 3D (as is the 3DS version), and you can even change the viewpoint to get a better angle on the level if needed, so this may not affect some people at all. Pushmo World is an extremely polished, highly addictive game that anyone can enjoy. It has tons of interesting puzzles built-in, and a near-limitless number of puzzles available for free online. Whether you like easy puzzles or puzzles so hard they’ll make you want to murder a hobo, Pushmo World has it all. Plus, you control a tiny sumo wrestler. That alone should warrant a purchase. Benjamin Luthi loves Nintendo so much, he owns a Virtual Boy (and he enjoys it). Follow him on Facebook or Twitter. This review is based on a game that was independently purchased at full price. The reviewer has played 10+ hours of puzzles and has not (yet) thrown the GamePad in frustration. Pushmo World is available on the Wii U eShop for $9.99.